� In 2006 Loomis and Hans Stolfus won the Australian Championships while in 2007 they became the first U.S. men's team to medal in the Pan American Games (silver medal). � Loomis failed to qualifiy in his first three events, but following that he advanced to the main draw in 11 of the 14 qualifiers he played in. � Loomis was one of four AVP players (along with organizer Angie Akers, Hans Stolfus, and Jenn Snyder) to visit U.S. Army troops in Kosovo in the summer of 2007. 2009: Formed a partnership with Casey Patterson, playing the first six tournaments with a best of fifth. Then Loomis played one event with Jonathan Acosta. Loomis and Patterson reunited in Brooklyn, and the pair overcame a third round loss to win the title in what was the first final for both players. To win, Loomis and Patterson won four straight matches against the top four seeds in the event. In Hermosa Beach the duo had a contender's match in which after losing the first set, they won the next set 38-36 and then won the match. Less than three hours later they duplicated the feat, winning the second set 40-38 in establishing an AVP main draw record for the most points in a set. 2008: Continued his partnership with Stolfus, placing seventh twice in five events. For his remaining seven tournaments, he played with four different partners, getting a best of seventh with Larry Witt. Loomis led the Tour in aces per game (.95). 2007: Started the season with Brent Doble, getting a best of ninth in Dallas, where they eliminated top-seeded Mike Lambert and Stein Metzger, marking just the third time a number-one seed placed 17th. Formed a partnership with Hans Stolfus, and the duo improved from 13th to ninth to fifth to third, as Loomis played in his first semifinal in Chicago. The pair also had a fifth in Cincinnati to end the year. Prior to the Chicago event, Loomis and Stolfus represented the U.S. in the Pan American Games in Brazil, and despite being seeded 14th, they finished second and won the first ever medal for America in the Games history. Loomis ended the year third in aces per game (.79) and sixth in hitting percentage (.418). 2004: Loomis played five events with Ryan Mariano with a best of 17th, including in Manhattan Beach after defeating a pair of Olympians, Eric Fonoimoana and Kevin Wong, in the first round. Played four other events with three different partners. While he didn't have enough matches played to qualify, his aces per game would have been second on the Tour. 2003: Played the first two events with Jake Gibb, with a best of ninth after emerging from the qualifier both times. He finished the year playing alongside four different partners in five events, and advanced from the qualifier three times while being seeded directly into the main draw in a fourth. 2002: Loomis made his pro beach debut in Huntington Beach with Mike Scales, but the duo did not make the main draw in three events played. 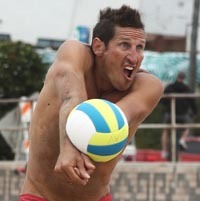 In Manhattan Beach, Loomis teamed with Leland Quinn and competed in his first ever main draw, placing 25th. College: Loomis played at UC-Irvine, where he led the 1999-2000 team in kills. Personal: Loomis was born in LaCrosse, Wisc., but when he was nine he moved to Georgia, where his sister Sara still lives.